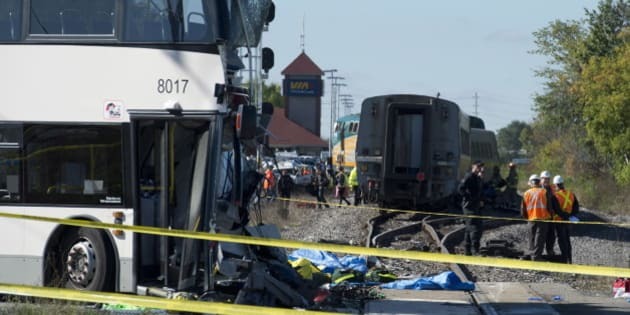 OTTAWA - The Via Rail passenger train that collided with an Ottawa city bus on Wednesday had no time to avoid the fateful crash, investigators suggested Friday, saying the engineer hit the brakes just two seconds before impact. Failure of the railway safety mechanisms designed to prevent such tragedies was also all but ruled out. "The crossing lights, bells and gates were activated 47 seconds prior to impact," officials told a news conference, where with the Transportation Safety Board offered an update as they continue to probe the scene of the deadly crash that killed six people, including the bus driver. The train was moving at 75 kilometres per hour at the time of impact, well below the speed limit at the location west of Ottawa where the crash took place, investigator said, relying on data from the train's 'black box,' which was recovered shortly after the crash. The train's horn was not in use, because of a municipal ban that prevents engineers from sounding the horn during certain hours of the day. A municipal bylaw states that trains cannot use their horns from 8 p.m. local time until noon. Had the train and bus been crossing paths during the afternoon rush hour, rather than in the morning, the engineer could very well have sounded the horn. Lead investigator Rob Johnston, however, said it's impossible to say whether use of a horn would have prevented the tragedy. "(Vehicles) are pretty sound proof these days," he said. In addition to the six dead, more than 30 people — all of them on board the bus — were injured in the crash, which derailed the train's locomotive and one of its four passenger cars. No one aboard the train was injured. The black box retrieved from the train provided all details about the mechanical operation of the locomotive _ how fast it was going, when the brakes were applied and whether the engineer pushed or pulled any device needed to operate it. Investigators said they hoped to glean the same kind of data from the bus, although Johnston said it will take some time to complete the investigation. ``The bus will be torn apart, and that will take some time,`` said Johnston. Ottawa police are conducting their own parallel investigation of the tragedy, and issued a call on Friday for anyone with pictures, video or other information about the crash to come forward. All six of the victims have been identified. All were from the Ottawa area. Along with the bus driver, 46-year-old Dave Woodard, two young Carleton University students Connor Boyd and Kyle Nash, both 21, were killed in the crash. So were Michael Bleakney, 57, Karen Krzyzewski, 53 and Rob More, 35. Woodard was at the wheel of the OC Transpo 76 bus when passengers said they yelled for him to stop as they saw the train coming down the tracks. The transit route where the crash took place, along with the train tracks, were re-opened Friday morning as crews continued to remove debris and work on fixing the tracks. Bus passengers sat in silence on either side of the guard rails as they watched the first Via Rail train pass by, at exactly 8:48 a.m. _ the same time the crash occurred on Wednesday.